Chris Kirk snuck in to take a one-shot victory ahead of Masters winner Jordan Spieth despite lengthy delays at the Crowne Plaza Invitational. Kirk managed to hold off a playoff with a group of three players all sitting in tied-second position - including Jason Bohn, Jordan Spieth and Brandt Snedeker. The 30-year old putted for par on the 18th to seal the victory at 12-under par for the tournament but was forced to wait for Ian Poulter to come home before victory was confirmed. Kirk's final round 4-under 66 was enough to ensure his nearest rivals were unable to force a playoff. "I felt nervous especially those last couple of holes," said Kirk. "Especially making that putt on 18." 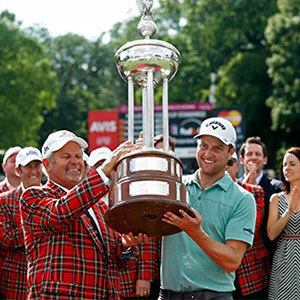 With this win, Kirk now has four wins on the PGA Tour with this his fifth professional win. His last win came at the 2014 Deutsche Bank Championship. "I've always loved this golf course, this has been my favourite tournament on the Tour since before I was on the Tour. "I was pretty nervous at times today. I was struggling a little bit with my driver, not quite hitting it how I wanted to, but my putting stroke felt great all week, so I definitely felt good. "I came here twice for the Ben Hogan Awards ceremony and just a really special place for me and I'm beyond honoured. "I felt like I was kind of struggling with my swing a little earlier this week and still didn't feel great with the driver down the stretch, but to be able to sort of gut it out and make the putts when I needed to make them and get a win really feels sweet. A former Hogan trophy winner, Kirk said: "It's just unbelievable be part of the history of this tournament. "It's really just amazing to me." England's Ian Poulter was unable to maintain his early round momentum eventually coming up just short in a group tied-fifth at 10-under for the tournament. "I'm just disappointed that obviously I didn't get the job done and I really should have and I didn't do it," said the 39-year old. "I didn't play well enough today." The tournament had threatened to be heavily delayed, with the Sunday starts pushed back from 7am until 10am.